The latest from Disneynature, Born in China gives us a rare glimpse into the wilds and mountainous regions of China, and the many animals that inhabit them. The film follows a mother snow leopard trying to protect and provide for her two young cubs, a growing family of golden monkeys, and a panda mother affectionately caring for her baby. This is the sort of film that benefits from being available to watch on Blu-ray, offering plenty of beautiful visuals, and putting us up close and personal with these animals and their breathtaking natural landscapes. 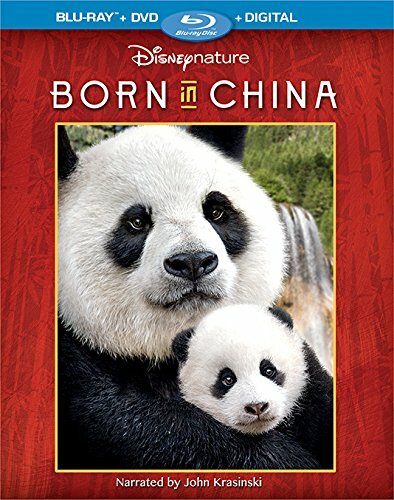 Narrated by John Krasinski in a way that is perfect for young viewers, Born in China is a pretty wonderful film to watch. You can read our three views of the film right here. The Blu-ray also includes the four featurettes Panda Suits & Bamboo Shoots, Walking With Monkeys, Masters of Camouflage and Wading Through Wetlands, as well as a music video for the end credits song “Everything Everything” by American Authors. Born in China is a Walt Disney Studios Home Entertainment release. It’s 79 minutes and rated G.